Every once in awhile, you stumble across something so extraordinary, it causes you to pause to breath it all in. That’s what I did when I found the amazing Hippie Roots perfume made by Muralada Rotella of Estacada, Oregon. Muralada and I met at the THC fair in Salem this March. At once I knew that we had to tell everyone about her incredible products. 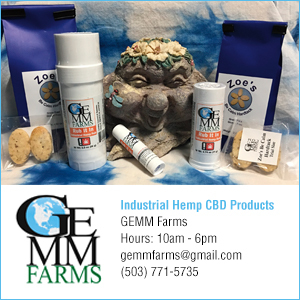 Her business is called Hippie Roots, and she makes wonderful hemp products that aid in healing and comfort while they also beautify. Muralada is walking proof of the power of her products. She attributes her radiance to the daily use of her natural, toxin-free, and hypoallergenic hemp products. Muralada says that her hemp products help regenerate and energize the skin’s protective layers and slow aging, while also helping with elasticity. Her claims are substantiated by National Institute of Health studies on the amino acids in hemp, which are Omega 3 and Omega 5 fatty acids (see article on page 54 for more on this topic). Hemp also provides skin with vitamins C, E, B1, B2, D and Carotene. Her ingredients are all locally sourced and organic. I was gifted with an amazing bag of goodies and have had such a fun time trying them out. I barely have any left because everyone that comes to the house leaves with something! I can sincerely attest to their exquisite quality. The creative recycled packaging first catches your attention. How it feels on your skin is a testimony to quality. Hemp protein powder is magically beneficial for skin. The body spray smells great and makes me feel at peace. The Lazy Day’s perfume is scented with essential oils, and people can’t stop complimenting the fragrance when I wear it. The eyeshadow is heavenly! It looks like we’re off to the next THC fair to get more Hippie Roots products! And, simply CLICK HERE to visit their Instagram to view pictures of products. I was at the thc convention may, in coos Bay and purchased some body oil. I would like to order some more. How do I contact Muralada Rotella?